The Memorial Centre was purchased by public subscription and fund raising activities soon after the end of WWII. The Centre was purchased in 1946 and after extensive renovations the building was opened and occupied in 1954 as the State Headquarters of the RAAF Association in Tasmania. The bullding was orginally held in trust for all members by Trustees but as the Association became an Incorpated Body in 2001, the Trustees, in April 2013, transferred to property from their holding into that of the Association. The Association uses the most of the Ground Floor area of the building for State Adminsitration and member activities, largely through Hobart Branch. Part of the eastern section of the Ground Floor and the Upstairs areas are leased to tenants whose rents provide the Division with much needed revenue to promote Member Welfare support and activities. The Museum, located on the First Floor of the RAAF Memorial Centre, was opened by the then Chief of the Air Staff (CAS) Air Marshal J.W. Newham AO on 13 September 1986 and contains many interesting exhibits. The main thrust of the exhibits is centred around the service of Tasmanians in the RAAF over the years from formation to present day. The Museum operates under the authority of the State Council and is governed by the Tasmania Division Constitution which provides for its being , mangement and control. The Museum is open to inspection by prior arrangement. Any person, club or group who wishes to pay a visit and have a conducted tour is asked to email the State Secretary of the Tasmania Division (Deb Coulson) on: secretary@raafatas.org.au or Telephone the Division Office on (03) 6200 9221. A message service is active when the office is unattended. The Rising Damp has now been rectified leaving our room dry and well refurbished. The Library has now been catalogued and is a very substantial asset. The following Hire Charges and Policy has been determined by the State Executive on 15 March 2013. The above charges are based on an evening use averaging up to 6 hours. Morning or afternoon hire for shorter periods may also be negotiated. The Training/Conference Room is set up for about 15 people with whiteboard, wi fi and OHP facilities. Comfortable chairs have been installed for greater comfort. With the set up of our Training Room/Conference facility we are able to offer ESOs, Community and Military based Associations access to this great facility. 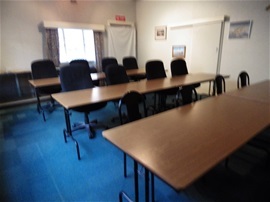 Need a Training or Conference facility? Set up and ready to roll! We have a dedicated Training/Conference Room that will seat up 14 people with Desks, comfortable Chairs, White Board and Wi Fi facilities. In addition we have kitchen facilities to support your catering needs. Purpose: To outline the policy regarding the hire of the RAAF Memorial Centre Hobart by members of the Associations and other approved persons. 1. The RAAF Memorial Centre is available for use by members and other outside Service related organisations. The policy governing the hire of the premises is hereunder. 2. All applications to hire the Memorial Centre shall be made on the form prescribed, and lodged with the Divisional office. The State Executive will determine the cost of the hire. 4. Once approval for the hire has been given, the hiring fee is to be paid to the Association before the date of the proposed activity. All hirers will be briefed on the OH&S provisions relating to use of the Memorial Centre and shall sign the copy of the briefing form to the effect they understand and will comply with the OH&S provisions applicable. 5. A members or person hiring the Memorial Centre shall be provided with access to the building on either the day of hiring or the last working day before the date of the hire. The State Secretary, or in his absence the State Treasurer, is responsible to arrange for access, key issue and return. The responsible member is to have cognisance of building security issues in all cases of hire. 6. The hirer (s ) is/ are to ensure the Centre is left in a clean and tidy condition and shall be restricted to those Rooms or areas of the Memorial Centre designated in the Application to Hire. In the event the premises are not left in a satisfactory state of cleanliness, the hirer will be charged for the necessary cleaning to be undertaken by the Memorial Centre Cleaner. NOTE: All Corporate Regulations are reviwed each year by the State Executive and either confirmed or amended.